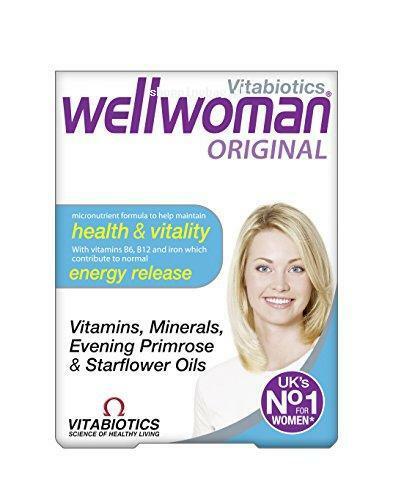 Wellwoman Original has the combination of essential vitamins, and minerals which brace the overall health of women. Many systems in women body require nutrition to work properly and these nutrients are provided by Amazon imported wellwomen in Pakistan. Its formula also includes starflower oil and evening primrose oil. The essential nutrients include Vitamin D, E, K, C, B1, B2, B6, B3, B12, Biotin, magnesium, zinc, copper, selenium, manganese and much more. The nutrients lavishing composition supports immune system, nervous system, and hormonal system. On proper supplementation of these capsules, women can get better energy level, healthier overall body and nourished hair, nails and skin. It enhances the beauty naturally and keeps the women’s health maintained. It is recommended to take one capsule in a day with your main meal. One pack of Wellwomen original has 30 capsules. You can find this all rounded capsule from Amazon online shopping in Pakistan. It is available at reasonable price in the collection of Amazon imported products in Pakistan. Find the Amazon Wellwomen original price in Pakistan and buy it to get the product at your doorstep in Pakistan with fluent payment methods such as cash on delivery.